In 1934, Burleigh Grimes threw the last legal spitter in baseball history. Over the preceding 19 seasons, he won 270 games with seven different teams. 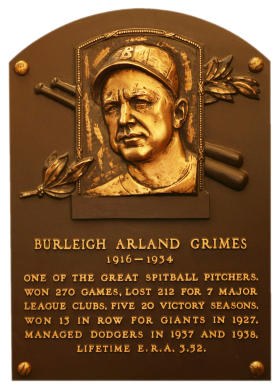 One of a handful of pitchers allowed to throw the spitter after its ban in 1920, Grimes was by far the most successful. "Ol' Stubblebeard" won more than 20 games in five seasons, and led the NL in complete games four times. Comments: In April, 2003 I picked up a tribute card of Grimes as a temporary placeholder until I could find an issue contemporary to his career. It was a raw, mint 2001 Upper Deck Legends of New York #23 won on eBay. In August, 2007 I replaced it with a raw 1923 W515 card purchased via eBay. I picked up another raw copy in December, 2007. Both were submitted to PSA and received low grades. So, I upgraded to a PSA 3.5 with another eBay win from Ben Binegar (benb51) in August, 2008. In January, 2010 I found a SGC 60 example on eBay and won that auction. 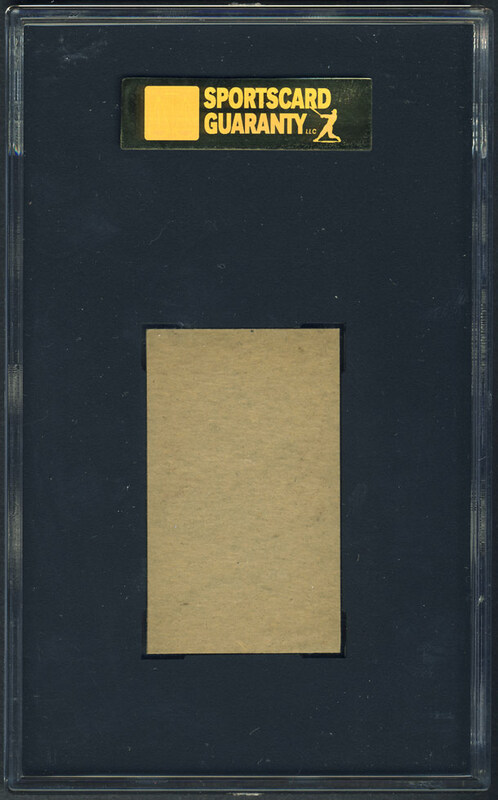 In March, 2011 I found this gorgeous SGC 88 on the bay from and was thrilled to win the card. I don't think there's a nicer copy in the world. Description: Cards in the 60-card "strip set" measure about 1-3/8" X 2-1/4" and feature color drawings. Backs are blank. 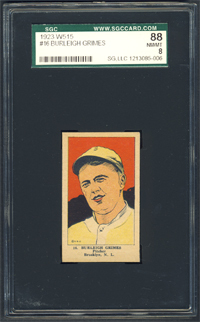 The card number along with the player's name, position and team appear in the bottom border. 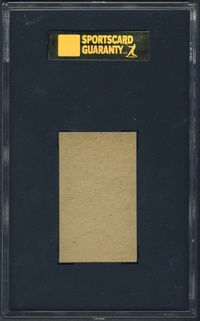 Most cards also display a "U&U" copyright line, indicating that the photos were provided by Underwood & Underwood, a major news photo service of the day. The set has a heavy emphasis on New York players with 39 of the 60 card depicting members of the Yankees, Dodgers or Giants. Babe Ruth appears on two cards and two other cards picture two players each.